Spider Solitaire 444 - Play game free online! 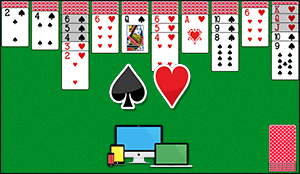 Play Spider Solitaire free online, one of the most popular patience card game! Now on Multiple Devices! 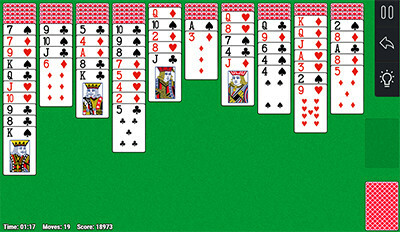 Spider Solitaire - one of the most popular patience card game in the world, which is included in the standard set of games of the Microsoft Windows operating system, thanks to this game became popular and famous. Where did the patience get such an unusual name? The answer to the question lies directly in the process of unfolding solitaire, the cards and a stack of cards move in all directions, the collected card chains, as if spiders are coming down. It seems that some invisible spider weaves its unusual web. 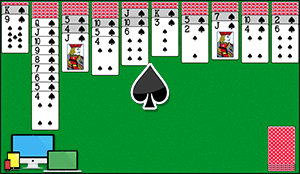 There are three variants of the classic Spider Solitaire. The first version of the solitaire is the simplest with one suit, the second is more complicated with two suits, and the third most difficult to unfold with four suits and collect it can not everyone. In a complex variant, the probability of winning is 30%. Actively using the cancellation of moves, the probability of winning is close to 50%. 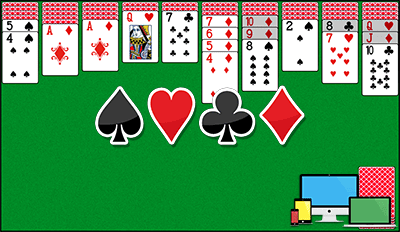 You can play mobile Spider Solitaire 444 on our website. This free online game is available in browser across all your Android, iOS and Windows devices. Good luck and have a good time!